Created to give an old farmhouse feel yet using practical and maintenance free materials on the exterior of the home created a nice juxtaposition of old and new for this comfortable and warm home. Use of indigenous materials such as local blue stone, true three coat stucco and a pre painted metal roof with copper gutters ground this home to its local roots and siting. Siting is of critical importance for the flow of natural light throughout the day. The light in this home moves with the daily functions of life creating a feeling that the sun wakes up for owners everyday. 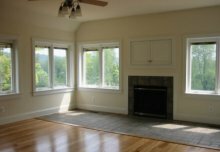 Views are maximized through the use of large windows and french doors. A customized floor plan created to maximize the feeling of openness and privacy, an even combination of form and function, and the mix of natural and synthetic materials continue the theme of mixing old and new. Vistas created within the home through the open floor plan create dramatic spaces and views inside the house. 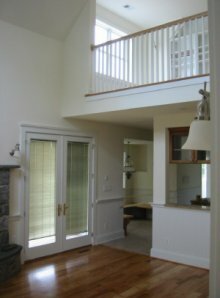 Hardwood floors, a custom made stair case and built-ins give this home a hand crafted feel. 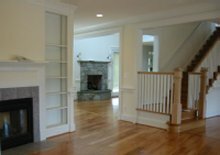 Gas fireplaces throughout add warmth and comfort to the open spaces. 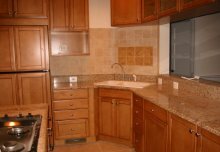 The kitchen has stained maple cabinets with granite countertops which adds texture to the space. Ceramic tile lines the walls which provides for easy clean up and a nice personal touch to the space. 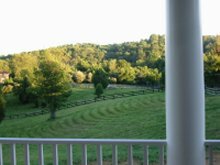 The view of rolling hills from the southern porch gives the owner pleasure in viewing their horses as they graze throughout the day.